Review: Demon hunting teenagers, what could go wrong? Teenagers and exorcism, what could possibly go wrong? As if young Shelby doesn't have enough going on in her senior year of high school she is also learning to be an exorcist from her uncle who is a priest. Learning Latin for fun sounds awesome /sarcasm. As with most first jobs, Shelby is struggling with the responsibilities placed before her, especially when it requires her to miss her study sessions with her crush Spencer. Soon enough they will find out they have a lot more in common than they think, and Shelby will uncover a secret that makes her take her exorcism training much more seriously. 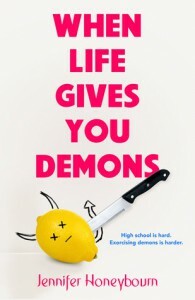 While the story starts out light and full of teenage sarcasm, it quickly becomes an interesting exploration of demons and the power of exorcism/faith. Family ties and loyalty are an underlying theme woven into several relationships in the story. Shelby's quest to find her mother and her lackadaisical attitude towards her uncle are important throughout her journey into demon hunting. I enjoyed every aspect of this gem of a story and would recommend this to readers who enjoy quirky young adult books.